When we talk about exercising, running, swimming, cycling or going to a gym normally comes across our mind. Whatever it is, riding an electric scooter as a form of exercising, most of us never thought about it. But an electric scooter also offers surprisingly plenty of entertaining ways to get your body work out and burning some calories. Those days are over when people used to think, electric scooters are for lazy guys. If you bring some changes the way you used to ride your scooter past, you can achieve a solid and enjoyable exercise using your electric scooter. To assist you in trying innovative exercises, here we are presenting some tips by following which you can boost your health significantly. Riding scooter with a broken track that’s full of twist and turn can be an immense source of experience and physical workout as well. It will provide you chances to get your entire body engaged as you use your body weight to cope with a hilly route. It will increase your heart pumping and thus aids in burning extra calories. 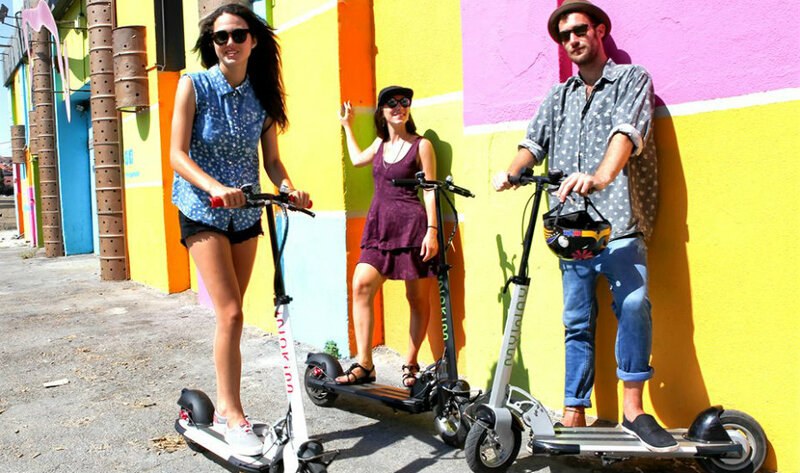 An electric scooter is a versatile device that can be used in numerous way. No doubt the most used and familiar way to ride an electric scooter is riding with motor power. But you can also ride it using everyday kick riding, keeping your scooter at a deficient speed or even turned off. Combining electric power with your body strength will bring better result both for your body and your scooter. Suppose you are going to ride 20 miles. So, here you can divide it into two- 10 miles by motor riding and another 10 by manual pedal riding. After riding few miles with motor, try some with pedalling. Once you are panting and have had a fill of cardio, again alternate. Thus, not only you will get a good workout and burn extra fat, but also save fuel and improve battery life. Some so many people enjoy doing a stunt with bike and scooter. You can also enjoy some safe challenges with your scooter. You can do some moderate hand exercises with your electric scooter. Start your scooter at a slow speed and grab any handheld weight like a dumbbell in one hand and do some bicep sets or any simple arm lift movement. And with another hand hold the steering of your scooter. In this way, your arm, muscles, and shoulders will be healthy. Taking your dog for a walk or series may be boring for you. But if you take your scooter along, it might become enjoyable for you too. And your furry one will also be happy because, in this way, he will be able to run three times faster than by foot. Just make sure while riding scooter it remains at a relatively slow speed, and you are holding your pup’s leash tightly. While doing this, you can also adopt manual kick riding. Of course, your dog needs to be well trained to practice this one. If you want to do some full body work out with your scooter, you are allowed to do that too. For this, carry your electric scooter for sometimes. Whenever you are on a long ride, after every few miles, stop and power off your scooter. Then carry for a few minutes. In this way, your full body will engage in this workout. Apart from this, this act will also aid in your scooter’s increased battery life. All in all, if you can do some brainstorming, innovative and creative ideas will come across your mind. Thus you can do multitasking. If you make the proper use of your electric scooter, it’s versatility will amaze you.